You are here: Home / Uncategorized / YouCanMakeThis.com Giveaway! I’m WAY excited about this! I’ve been a fan of YouCanMakeThis.com for a long time, so when they asked me about doing a giveaway, I jumped on it! With the holidays just around the corner, we thought it would be fun to showcase some quick and easy gift ideas you can give to friends, neighbors, co-workers, and oh yes…even your family! You can enter to win eBooks from www.YouCanMakeThis.com and learn some fun new techniques, tips, and ideas not only for the people on your list, but also creative ways to decorate your home! You Can Make This has created a free download for some fun gift tags. Each of them coordinate with ideas found as part of the DIY Gift Giving Series videos that can be found at www.youcanmakethis.com/blog , as well as designs and patterns found at www.SWAKembroidery.com and www.YouCanMakeThis.com. You can also enter to win hundreds of dollars in gift certificates just for watching the videos that are part of the DIY Gift Giving Series and answering a question on the You Can Make This blog! So, what can you win here at Crap I’ve Made? I’ll be giving away TWO bundle packs, courtesy of YCMT. The bundle packs each contain both the Kimberbell Kids 24″ doll and the Gift Exchange clothing and accessory pack! How do you win? Leave a comment. This giveaway is open to anyone ANYWHERE with a valid email address. I’ll draw 2 winners Wednesday, December 16th at 10 pm MST. Fun! Thanks for the giveaway! What a fun pack! I'd love to win! Lovely, my little girl would love a dolly! I LOVE you canmake this. What an awesome giveaway!! I'd love to win this! I just found your blog a while ago – don't remember exactly how I got here. I really enjoy all the projects you share. But the real reason for my post is I just had to tell you that I smile every time I see the name of your blog on the sidebar of mine! My Hubby says to me just about every time he walks into my craft room "what crap are you making now?"! Anyway, just wanted to share. Please enter me in the great giveaway. Thanks! What a great giveaway! I love YouCanMakeTHis.com! I like hot cocoa and cookies. How have I never heard of this website before? Will have to go check it out! Those doll are so adorable! I would love to make one for my daughter! This is a great giveaway, I hope I win! Thanks for the giveaway! Pick me! Pick me! WOW thank you so much!!! I would love to win but of I dont someone is VERY lucky!!! What a fantastic giveaway!!! Have a wonderful day! I really like that site, thanks for a chance to win some great patterns. woo hoo sign me up! Crossing my fingers. squeee!! how cool!! thank you!! 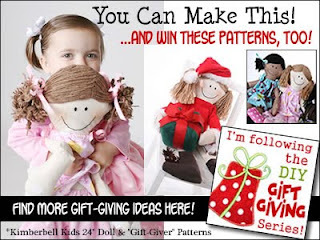 i think this doll pattern is one that i have saved in my wishlist at ycmt! Fun! I like free stuff! Oh, fun! I love how you just casually say, "they ask me if I wanted to do a giveaway"… I mean, does that just happen all the time? You're so cool. Woo hoo! I love you can make this! Thanks for hosting this giveaway! Never heard of that site, I'll have to check it out, what a great giveaway! I'm not sure I actually believe I *can* make these things, but handicrafts are a part of our homeschool so I'm entering. I love that doll! Enter me! Actually, I've been bummed because I can't get any posts to post to the YCMT blog to enter any of their giveaways, so I'm excited to see that you are doing one. Oooooh, I'd love to win!! Can I just give a shout out?!? TO YOU?! You rock. Happy Holidays! perfect timing! hope I win! Woohoo! What a great giveaway! So fun! I would love to win this! I'd love to win one of those dolls, they're beautiful. What a great give away! I love your blog. i believe you have my email. Oh, I'd love this! Thanks for the chance! What a great idea! I'd love to win! These look great. I would love to win them. Oh I would love to win this! I have used some of their tutorials and they are great! That's a great give away! Please count me in! Thank you for hosting our giveaway! Your blog is awesome! Have a Merry Christmas! Pick me pick me pick me!!! You already know I love your stuff. How fun – I just love their projects! Love this site! I would love to win, I have ideas already! I am just starting to get reaquainted with my sewing machine. This would be a good win for me! I need some projects to get me thru the January dulldrums! How exciting!! Pick me, pick me!! Great blog, great giveaway, my fingers are crossed!!!! Oh count me in! My fingers are crossed tight!!! Me! Even though I am not crafty at all. I love YCMT! they are awesome and they have some wonderful patterns and i love when they are free too! I even got a free pattern for a pettiskirt! :) i love those things..and their site! I love YCMT too!!! I hope I win! I love your blog and I just recently discovered YCMT! I'm a SAHM to a 5 month old and I LOVE sewing and crafting! So cute. The doll reminds me of one I had when I was little. My 18 month old would love this, thanks for the opportunity to win. I hope I win! this is a great site! thanks for sharing!!! Oh yes me…I would love to win!!! Perfect for my little girls. I wanna win! I love that site! Fun stuff and great patterns! I love your blog! and i would love to win anything on it!!!!! i'll keep my fingers crossed!!!!! hopefully we will know soon so my fingers dont stay crossed forever! I just made the snowflake/star project today. Thanks for the great ideas!